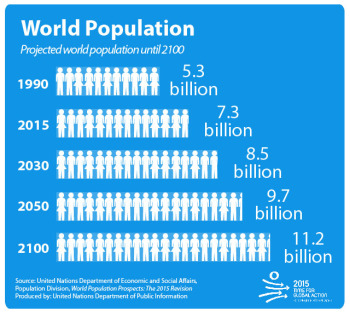 There are more humans alive on Earth right now than ever before—7.3 billion—and that number is still growing, with UN projections that it will reach 9.7 billion by 2050. A population of this magnitude brings a lot of challenges, food production chief among them. The UN Food and Agriculture Organization predicts that we need to boost worldwide food production by 70 percent over the next several decades in order to feed the anticipated population of 2050. Agriculture is the oldest human industry, but it’s certainly no stranger to technological change. The industrial revolutions of the 19th and 20th centuries replaced handheld tools and horse-drawn plows with gasoline engines and chemical fertilizers. Now, we’re on the verge of witnessing another fundamental shift in agriculture thanks to a new industrial revolution and the technologies of Industry 4.0. Smart farming and precision agriculture involve the integration of advanced technologies into existing farming practices in order to increase production efficiency and the quality of agricultural products. As an added benefit, they also improve the quality of life for farm workers by reducing heavy labor and tedious tasks. Just about every aspect of farming can benefit from technological advancements—from planting and watering to crop health and harvesting. Most of the current and impending agricultural technologies fall into three categories that are expected to become the pillars of the smart farm: autonomous robots, drones or UAVs, and sensors and the Internet of Things (IoT). How are these technologies already changing agriculture, and what new changes will they bring in the future? Replacing human labor with automation is a growing trend across multiple industries, and agriculture is no exception. Most aspects of farming are exceptionally labor-intensive, with much of that labor comprised of repetitive and standardized tasks—an ideal niche for robotics and automation. We’re already seeing agricultural robots—or AgBots—beginning to appear on farms and performing tasks ranging from planting and watering, to harvesting and sorting. Eventually, this new wave of smart equipment will make it possible to produce more and higher quality food with less manpower. The tractor is the heart of a farm, used for many different tasks depending on the type of farm and the configuration of its ancillary equipment. As autonomous driving technologies advance, tractors are expected to become some of the earliest machines to be converted. In the early stages, human effort will still be required to set up field and boundary maps, program the best field paths using path planning software, and decide other operating conditions. Humans will also still be required for regular repair and maintenance. 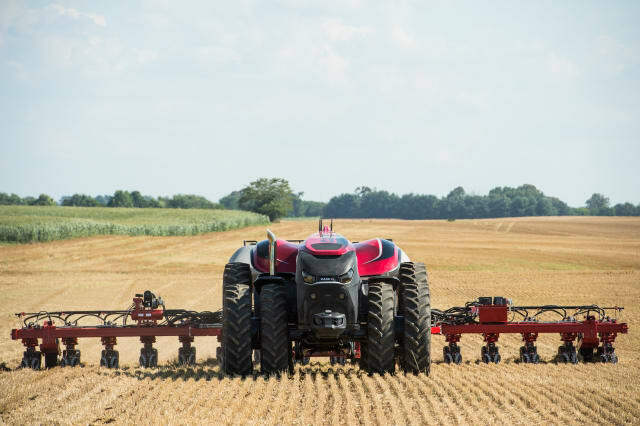 Nevertheless, autonomous tractors will become more capable and self-sufficient over time, especially with the inclusion of additional cameras and machine vision systems, GPS for navigation, IoT connectivity to enable remote monitoring and operation and radar and LiDAR for object detection and avoidance. All of these technological advancements will significantly diminish the need for humans to actively control these machines. Sowing seeds was once a laborious manual process. Modern agriculture improved on that with seeding machines, which can cover more ground much faster than a human. However, these often use a scatter method that can be inaccurate and wasteful when seeds fall outside of the optimal location. Effective seeding requires control over two variables: planting seeds at the correct depth, and spacing plants at the appropriate distance apart to allow for optimal growth. Precision seeding equipment is designed to maximize these variables every time. Combining geomapping and sensor data detailing soil quality, density, moisture and nutrient levels takes a lot of the guesswork out of the seeding process. Seeds have the best chance to sprout and grow and the overall crop will have a greater harvest. As farming moves into the future, existing precision seeders will come together with autonomous tractors and IoT-enabled systems that feed information back to the farmer. 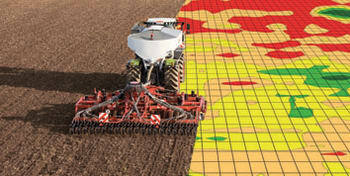 An entire field could be planted this way, with only a single human monitoring the process over a video feed or digital control dashboard on a computer or tablet, while multiple machines roll across the field. Subsurface Drip Irrigation (SDI) is already a prevalent irrigation method that allows farmers to control when and how much water their crops receive. By pairing these SDI systems with increasingly sophisticated IoT-enabled sensors to continuously monitor moisture levels and plant health, farmers will be able to intervene only when necessary, otherwise allowing the system to operate autonomously. While SDI systems aren’t exactly robotic, they could operate completely autonomously in a smart farm context, relying on data from sensors deployed around the fields to perform irrigation as needed. Weeding and pest control are both critical aspects of plant maintenance and tasks that are perfect for autonomous robots. A few prototypes are already being developed, including Bonirob from Deepfield Robotics, and an automated cultivator that is part of the UC Davis Smart Farm research initiative. The Bonirob robot is about the size of a car and can navigate autonomously through a field of crops using video, LiDAR and satellite GPS. Its developers are using machine learning to teach the Bonirob to identify weeds before removing them. With advanced machine learning, or even artificial intelligence (AI) being integrated in the future, machines such as this could entirely replace the need for humans to manually weed or monitor crops. The UC Davis prototype operates a bit differently. Their cultivator is towed behind a tractor and is equipped with imaging systems that can identify a fluorescent dye that the seeds are coated with when planted, and which transfers to the young plants as they sprout and start to grow. The cultivator then cuts out the non-glowing weeds. While these examples are robots designed for weeding, the same base machine can be equipped with sensors, cameras and sprayers to identify pests and application of insecticides. These robots, and others like them, will not be operating in isolation on farms of the future. They will be connected to autonomous tractors and the IoT, enabling the whole operation to practically run itself. Harvesting depends on knowing when the crops are ready, working around the weather and completing the harvest in the limited window of time available. There are a wide variety of machines currently in use for crop harvesting, many of which would be suitable for automation in the future. Traditional combine, forage, and specialty harvesters could immediately benefit from autonomous tractor technology to traverse the fields. Add in more sophisticated tech with sensors and IoT connectivity, and the machines could automatically begin the harvest as soon as conditions are ideal, freeing the farmer for other tasks. Developing technology capable of delicate harvest work, like picking fruit from trees or vegetables such as tomatoes, is where high-tech farms will really shine. Engineers are working to create the right robotic components for these sophisticated tasks, such as Panasonic’s tomato-picking robot which incorporates sophisticated cameras and algorithms to identify a tomato’s color, shape and location to determine its ripeness. This robot picks tomatoes by the stem to avoid bruising, but other engineers are trying to design robotic end effectors that will be capable of gently griping fruit and vegetables tight enough to harvest, but not so hard that they cause damage. Another prototype for fruit picking is the vacuum-powered apple picking robot by Abundant Robotics, which uses computer vision to locate apples on the tree and determine if they are ready to harvest. These are only a few of the dozens of up-and-coming robotic designs that will soon take over harvesting labor. Once again, with the backbone of a robust IoT system, these agbots could continuously patrol fields, check on plants with their sensors and harvest ripe crops as appropriate. The core concept of incorporating autonomous robotics into agriculture remains the goal of reducing reliance on manual labour, while increasing efficiency, product yield and quality. Unlike their forebears, whose time was mostly taken up by heavy labor, the farmers of the future will spend their time performing tasks such as repairing machinery, debugging robot coding, analyzing data and planning farm operations. As noted with all of these agbots, having a robust backbone of sensors and IoT built into the farm’s infrastructure is essential. The key to a truly “smart” farm relies on the ability of all the machines and sensors being able to communicate with each other and with the farmer, even as they operate autonomously. What farmer wouldn’t want a bird’s eye view of their fields? Where once this required hiring a helicopter or small aircraft pilot to fly over a property taking aerial photographs, drones equipped with cameras can now produce the same images at a fraction of the cost. In addition, advances in imaging technologies mean that you’re no longer limited to visible light and still photography. Camera systems are available spanning everything from standard photographic imaging, to infrared, ultraviolet and even hyperspectral imaging. Many of these cameras can also record video. Image resolution across all these imaging methods has increased, as well, and the value of “high” in “high resolution” continues to rise. All these different imaging types enable farmers to collect more detailed data than ever before, enhancing their capabilities for monitoring crop health, assessing soil quality and planning planting locations to optimize resources and land use. Being able to regularly perform these field surveys improves planning for seed planting patterns, irrigation and location mapping in both 2D and 3D. With all this data, farmers can optimize every aspect of their land and crop management. But it isn’t just cameras and imaging capabilities making a drone-assisted impact in the agricultural sphere—drones are also seeing use in planting and spraying. Prototype drones are being built and tested for use in seeding and planting to replace the need for manual labor. 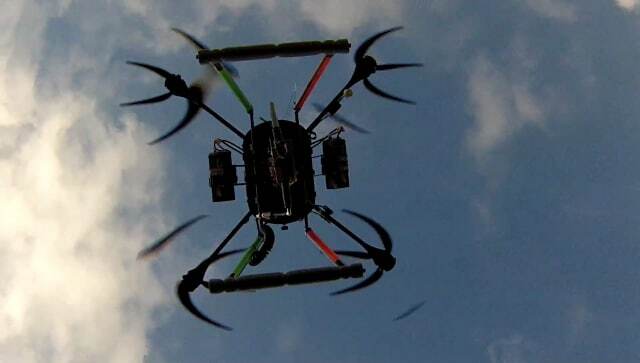 For example, several companies and researchers are working on drones that can use compressed air to fire capsules containing seed pods with fertilizer and nutrients directly into the ground. DroneSeed and BioCarbon are two such companies, both of which are developing drones that can carry a module that fires tree seeds into the ground at optimal locations. While currently designed for reforestation projects, it’s not hard to imagine that the modules could be reconfigured to suit various agricultural seeds. 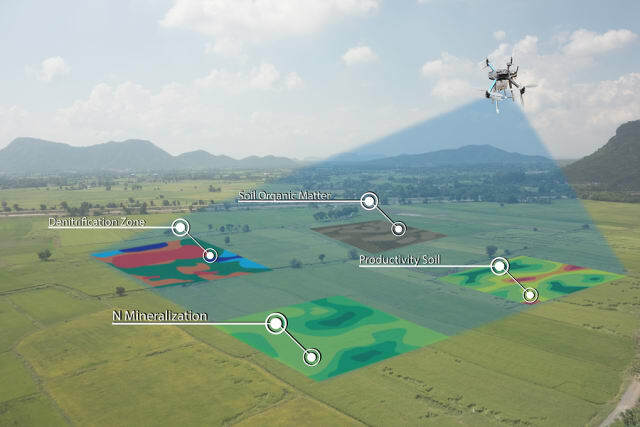 With IoT and software for autonomous operation, a fleet of drones could complete extremely precise planting into the ideal conditions for growth of each crop, increasing the changes for faster growth and a higher crop yield. There are also drones currently available and in development for crop spraying applications, offering the chance to automate yet another labor-intensive task. Using a combination of GPS, laser measurement and ultrasonic positioning, crop-spraying drones can adapt to altitude and location easily, adjusting for variables such as wind speed, topography and geography. 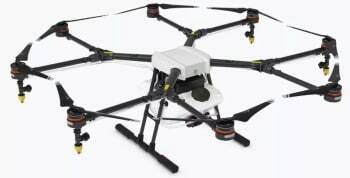 This enables the drones to perform crop spraying tasks more efficiently, and with greater accuracy and less waste. For example, DJI offers a drone called Agras MG-1 designed specifically for agricultural crop spraying, with a tank capacity of 2.6 gallons (10 liters) of liquid pesticide, herbicide or fertilizer, and a flight range of seven to ten acres per hour. Microwave radar enables this drone to maintain correct distance from the crops and ensure even coverage. According to DJI, it can operate automatically, semi-automatic or manual. Working in conjunction with other agbots, crops identified as being in need of special attention could receive a personalized visit from the nearest drone at the first sign of trouble. Being able to provide individualized attention to any part of the field as soon as it’s needed could help to stop many problems before they spread. One of the most useful tasks drones can take on is remote monitoring and analysis of fields and crops. Imagine the benefits of using a small fleet of drones instead of a team of workers spending hours on their feet or in a vehicle travelling back and forth across the field to visually check crop conditions. This is where the connected farm is essential, as all this data needs to be seen to be useful. Farmers can review the data, and only make personal trips out into the fields when there is a specific issue that needs their attention, rather than wasting time and effort by tending to healthy plants. Given that drones for agricultural use are still early in their evolution, there are a few downsides. Ranges and flight times are not as robust as many farms would need—currently, even the longest running drones max out at around an hour of flight time before needing to return and recharge. The capital expenses are also still quite high, as much as $25,000 USD per drone for something like the PrecisionHawk Lancaster. Less expensive models exist, but they may not come with the necessary imaging or spraying equipment. Innovative, autonomous agbots and drones are useful, but what will really make the future farm a “smart farm” will be what brings all this tech together: the Internet of Things. The IoT has become a bit of a catch-all term for the idea of having computers, machines, equipment and devices of all types connected to each other, exchange data, and communicating in ways that enable them to operate as a so-called “smart” system. We’re already seeing IoT technologies in use in many ways, such as smart home devices and digital assistants, smart factories and smart medical devices. Smart farms will have sensors embedded throughout every stage of the farming process, and on every piece of equipment. Sensors set up across the fields will collect data on light levels, soil conditions, irrigation, air quality and weather. That data will go back to the farmer, or directly to AgBots in the field. Teams of robots will traverse the fields and work autonomously to respond to the needs of crops, and perform weeding, watering, pruning and harvesting functions guided by their own collection of sensors, navigation and crop data. Drones will tour the sky, getting the bird’s eye view of plant health and soil conditions, or generating maps that will guide the robots, and help the human farmers to plan for the farm’s next steps. All of this will help create higher crop production, and an increased availability and quality of food. 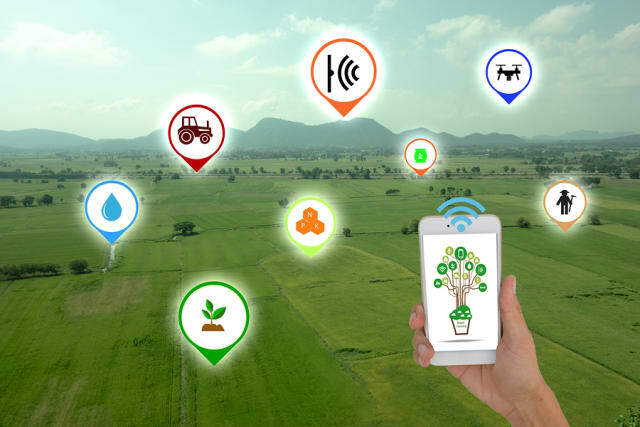 BI Intelligence shared their predictions that IoT devices installed in agriculture will increase from 30 million in 2015 up to 75 million by 2020. Under this trend, connected farms are expected to generate as many as 4.1 million data points each day in 2050—up from a mere 190,000 in 2014. This mountain of data and other information generated by farming technology, and the connectivity enabling it to be shared, will be the backbone of the future smart farm. Farmers will be able to “see” all aspects of their operation—which plants are healthy or need attention, where a field needs water, what the harvesters are doing—and make informed decisions. And this discussion has only touched on the tip of the proverbial iceberg with the focus on vegetative crops; there is an equal groundswell of smart technology adoption for animal husbandry, and many more drones and robots for every aspect of farming. If every farm in the country becomes a smart farm, reaching that 70 percent increase in food production is a certainty. What agricultural technologies are you looking forward to? Comment below.